Many small boat refrigeration systems use one of the small Danfoss compressors to power their system. The refrigerant used is R134a, a tertrafluorethane that has lower ozone-depletion characteristics than R12, which it replaced. R134a is available in small cans that enable topping up or recharging, both in its pure form for domestic systems or with added oil for automotive air conditioning units. The amount of oil present in these cans may be harmful for small refrigerator compressors, although this is currently unknown. We are conducting trials at present to establish this. New regulations in UK (See http://www.acrib.org.uk/MG7OLH18285) will make the recharging of marine refrigerators more difficult or impossible for the DIY owner. Although mobile air conditioning (automotive) systems are excluded, the regulations will make the purchase of R134a without oil impossible to an unqualified user. A qualified person will need to possess a refrigerant handling certificate that costs £500 to obtain. The only recourse of the boat owner will then be to employ a qualified person, at some cost. Owen holds the necessary qualifications for this activity. 1/4 inch Schraeder fitting is needed. 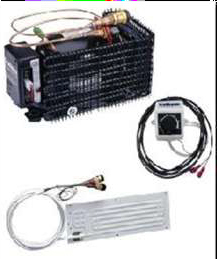 A standard car air conditioning top up kit can then be used to top it up. The adaptors are available from Ebay traders and from Kooltech. In some cases, for access reasons, an extension hose will also be needed to attach the canister. These are available from the same sources. Oil-free R134a continues to be available outside UK, where these regulations have yet to be implemented. Where the pure gas is available the following guide is applicable. Recharging a simple R134a/R12 capillary marine refrigeration system. The following is intended for the use of a boat operator with average mechanical skills. It will describe what symptoms to look for in a correctly charged capillary refrigeration system, and how to adjust the charge if an undercharged or overcharged condition exists. Working with refrigerants involves potentially dangerous pressures and temperatures and precautions must be taken to avoid injury. Eye and skin protection must be worn when working on refrigeration systems. Do not open the high-pressure service valve on your system, or connect anything to it. If you are unsure about your ability to safely accomplish any of the following procedures or if you cannot positively identify the low and/or high-pressure service valves, consult a marine refrigeration specialist. Before deciding which condition exists in your system, please read all of the following thoroughly. These guidelines are intended for use by operators of R134a marine refrigeration systems in the UK prior to introduction of the new regulations, and laws covering the use of HFC refrigerants may vary in other parts of the world. In all cases it is the duty of the person performing the service to verify that he/she is not violating any laws or regulations by following these guidelines. All items needed for correcting the charge are readily available online or from a refrigeration supplier. No refrigerant gauges are necessary for these adjustments, their use is not recommended except for major repairs and for evacuating the system No reference will be made to them in this guide. Most small yacht refrigeration systems are capillary tube systems, requiring a precise refrigerant charge to work at maximum efficiency. Too much or too little refrigerant will result in a system that will have some cooling effect, but will not be working to its full potential. In this type of system, the temperature of the evaporator is directly related to the amount of refrigerant in the system. There should be enough refrigerant in the system so that the last of the liquid is evaporating back to a vapour at the very end of the evaporator, and just as it enters the suction tube back to the compressor. After running for a time, there should be a slight coating of frost all over the surface of the evaporator with no condensation or frost on the exposed section of copper tube back to the compressor or condensation on the compressor itself. If the system has been installed correctly, a short length (approx 15cm) of insulation supplied with the system should be positioned on the tubing starting where it exits the refrigerated box. No other insulation is required, and any extra that has been installed will only cause the system to run at less than maximum efficiency and may conceal symptoms of an overcharge. This short length of insulation is installed to prevent any condensation that may occur as the cold tube leaves the refrigerated box and is exposed to hot, humid air. In a properly charged system, there should be a “tinny, gurgling” sound from the evaporator. If there is too little refrigerant in the system, it will have all evaporated back to a vapour long before it reaches the end of the evaporator. Some of the surface will have a coating of frost, but from the point where all the refrigerant has turned to vapour, the surface will just be cold and sweating. By following the channels in the evaporator, one can determine the path the refrigerant follows and the end of the capillary tube can be easily identified. This is where the liquid refrigerant is fed into the evaporator and where the frosting begins. The evaporator will probably sound the same as a properly charged system. If the system is seriously undercharged, the refrigerant may exist in the system only as a vapour, so there will be no frosting on the evaporator, just a slight sweating and cold to the touch. In this condition there will probably be a constant hissing sound from the evaporator. This is important in identifying if the system is undercharged or overcharged. Too much refrigerant in the system will result in liquid still evaporating back to a gas past the end of the evaporator and inside the tubing going back to the compressor. This means that there is still some of the refrigeration process going on inside the tubing and there will be a build-up of frost or ice on the exposed section. If additional insulation has been added, it may be concealing this symptom and should be removed. The evaporator may appear and sound normal, but will be at a higher temperature than desired, resulting in longer than expected run times. If so much refrigerant exits in the system that it raises the temperature of the evaporator above 0°C (32° F), the surface will only be sweating and cold to the touch, resembling an undercharged condition. But the copper lines leading back to the compressor, and maybe even the compressor itself will be also be cold and sweating. There will probably be a sound similar to a mountain stream coming from the evaporator. This is a potentially damaging condition as liquid may reach the compressor where it can damage the valves. Refrigeration compressors are designed to compress gas only. No special tools are required, but the following items will need to be purchased from an auto parts or hardware store. 1 – 16oz (or similar size) can of R134a refrigerant. 1 – Valve assembly for above. 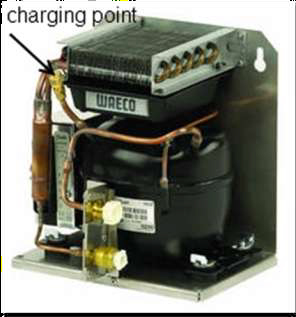 Connecting to the refrigeration system.First, you need to confirm that undercharged condition exists, and not a seriously overcharged one, as described in Section 1. If the system is seriously undercharged due to a leak, the problem will need to be rectified and the system evacuated with a vacuum pump before re-charging. Screw the valve assembly on to the can of refrigerant, then screw the adapter on to the valve assembly. Locate the end of the charging hose that has a valve stem depressor, screw the opposite end onto the adapter. Locate the suction side service valve and remove the valve cap. The suction side service valve is normally situated on a stub that is attached directly to the top of the compressor. If there are two service valves, make sure that you attach the hose to the suction valve and not the discharge valve. Do not remove the valve cap from the discharge side service valve or connect anything to it. If you cannot positively identify the suction side service valve, consult a marine refrigeration specialist. Prepare the can of R134a for charging. This is usually achieved by screwing in the handle on the top of the valve assembly to pierce the can, but follow specific instructions supplied with your equipment. With the system idle and having not run for 10 –15 minutes, allow a small amount of refrigerant to be discharged from the Charging Hose to purge air from the hose, then screw the end of the hose onto the suction side service valve. Run the system for a while, then add a small amount of refrigerant. This is usually achieved by backing off the handle on the top of the valve assembly, but check your specific instructions as some equipment may differ. Keep the can of R134a in an upright position while adding refrigerant so that no liquid is allowed to enter the system. Add the refrigerant in small amounts (say 5 seconds) and then let the system “settle down” for approximately 10 minutes. You should see the frosted area on the evaporator increase after adding some refrigerant. The process may be repeated if necessary until the symptoms of a correctly charged system are met (see Section 1). Make sure that the valve on the can of R134a is firmly closed after adding refrigerant. As the refrigerant is added, the can of R134a may become very cold and even have frost forming on the outside. When the charge in the system is correct according to the conditions described in Section 1, remove the charging hose from the suction side service valve while the system is running. Replace the valve cap firmly. It is very important that you correctly identify the suction and discharge (if fitted) service valves. The suction side service valve normally will be on a stub of tubing that is connected directly to the top of the compressor. If you are unable to positively identify the suction side service valve, consult a marine refrigeration specialist. Run the system long enough for the symptoms of an overcharge to exist and then remove the valve cap from the suction side service valve. Wearing gloves, eye, and skin protection, and with the system running, cover the top of the valve with a rag or paper towel, holding it there with one hand. Slide the end of a screwdriver or similar tool under the rag or towel with your free hand, and depress the valve core for a short time (say 5 seconds). This should allow some refrigerant gas to escape and maybe some refrigerant liquid. If liquid is released it will immediately evaporate at very low temperatures, so all precautions must be taken to avoid contact between liquid refrigerant and skin or eyes. There will probably be some oil that is released with the refrigerant and this is normal. After releasing some refrigerant, let the system “settle down” for approximately 15 minutes, then visually check the system. On a slightly overcharged system you should see the frost line on the tubing move back towards the evaporator or disappear completely. Repeat the process as necessary until the system shows the symptoms of a correct charge as described in Section 1. On a seriously overcharged system it may take repeated releases before the symptoms of a slight overcharge appear. When the charge has been adjusted correctly replace the valve cap firmly.